Cassie, left, and Maggie MacDonald play a Celtic concert Sept. 17 at St. Francis in the Foothills. Advance tickets $20 general, $18 for students and seniors age 60 and up; $3 more at the door. Advance tickets at www.inconcerttucson.com for $3 per ticket fee; available for no fee at Antigone Books, 411 N. Fourth Ave., 792-3715, and The Folk Shop, 2525 N. Campbell Ave., 881-7147. 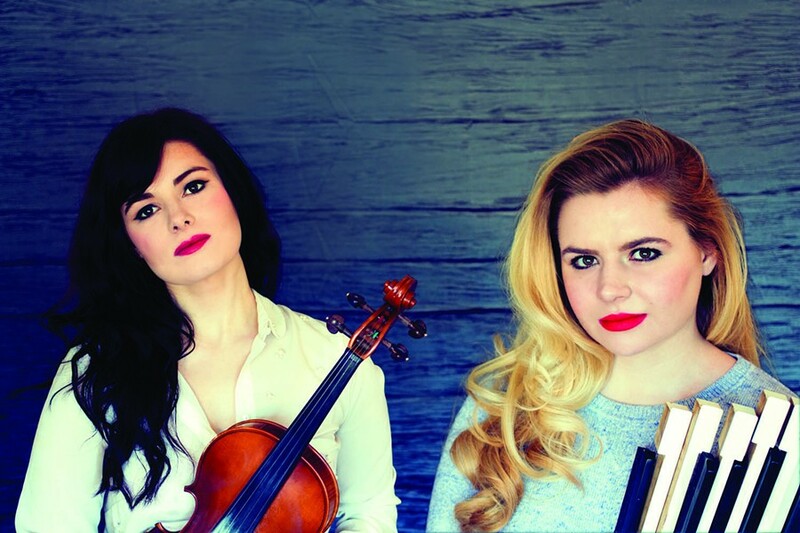 Canadians Cassie and Maggie MacDonald play fiddle and piano, an instrument combo that strikes American lovers of Celtic music as "odd," says Cassie, speaking from her home in Halifax. "But it's a classic combination in Nova Scotia," notes Cassie, who will play fiddle at a concert of Celtic music with her pianist sister Maggie in Tucson next week. So classic, in fact, that the young women's grandparents played exactly those two instruments. Grandfather Hugh Angus MacDonald was "one of the first fiddle players from Nova Scotia to travel to Montreal to record. He went twice, by train – there was no highway then – and made six records," Cassie says. Grandmother Winnie MacDonald, a pianist, played with Hugh in live performances. As children, though, they listened to Hugh's records and other Celtic music at their remote home in the seaside village of Morristown. "We had an encyclopedia of recordings at home," Cassie says. "We grew up listening to these old tunes. When we started playing, we already had these melodies on our mind." The MacDonalds' new CD, their second, Sterling Road, mixes traditional Scottish tunes with contemporary works that sound traditional. "The King's Shilling," by Ian Sinclair, for example, was written in the last 10 years but sounds much older. So do the tunes Cassie and Maggie write themselves, including "Sweet Melodies." Besides fiddle, Maggie plays guitar, banjo and accordion, and as of two years ago, both sisters sing--the new CD has four vocal tracks. "Where we grew up people listened to instrumental," Cassie says. "We noticed in the States that people really responded to vocals. We've been experimenting and now we really enjoy it." Their distinctive sound, combining Scottish tunes with Cape Breton reels and Antigonish polkas, just won them the 2015 Live Ireland award for best ensemble. The Chicago Irish-American news named them top emerging artist in 2014. In concert, both of the women dance. "I do the most," Cassie jokes, "but Maggie will get up if we coax her." They started Highland dancing to Scottish bagpiping as wee lasses. In Nova Scotia, steeped in traditional Scottish arts," "it was the thing to do as young girls." And both continued dancing seriously until their mid-teens, even traveling to the U.S. and Scotland to compete. Scottish dancing is "done in hard shoes but it's not as rigid and structured as Irish dancing," Cassie says. "There's more of a relationship between the dancing and the music." The early Highland dancing brought them into Nova Scotia's intense traditional Scottish music scene, but as kids they were studying classical music with Suzuki teachers. Cassie wasn't excited about violin until she realized at 9 that she could transfer her classical skills to Celtic fiddling. Both girls went on to study music in the summers at the Gaelic College on Cape Breton Island. They left their rural home to go to university in Halifax, but they've now "postponed" their degrees to devote time to recording and traveling. Their Tucson stop is part of a packed Southwest tour that will take them on a road trip to Flagstaff, Prescott and points in New Mexico, Colorado and California. "We're road warriors," Cassie says. Back home in Halifax, they play regularly, including a weekly gig at Durty Nelly's Irish Pub. Their pioneering grandmother Winnie catches their shows when she can. At 98, "she still plays piano and still comes to our concerts."